Georgie, now that we’ve had our rest, I have so much to tell you about our travels. It was a long but interesting trip. We went to six countries – Switzerland, Austria, Italy, Luxembourg, Holland, France and they all spoke different languages – sometimes three within the same country. 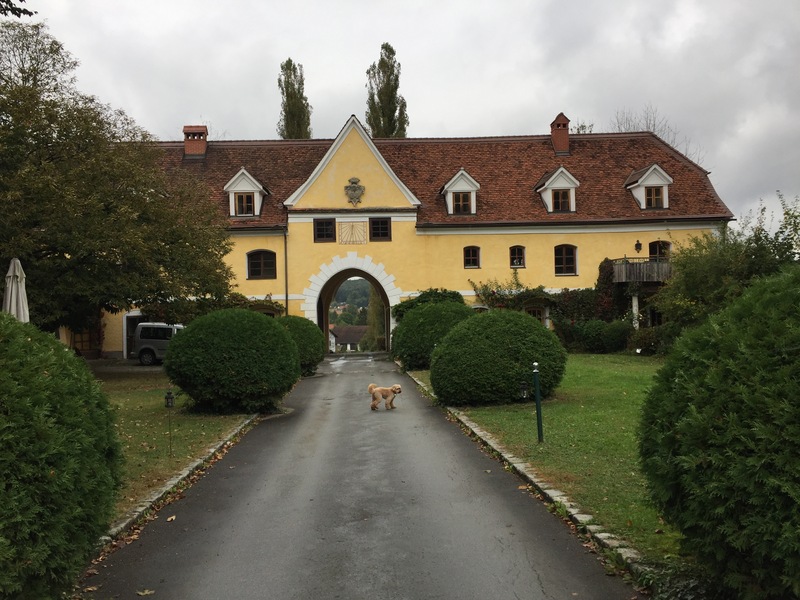 Of course you know the reason for our trip was Markus and Sylvia’s wedding in a schloss in Sebersdorf – a small town in the south-eastern part of Austria where it’s famous for their thermal spas. 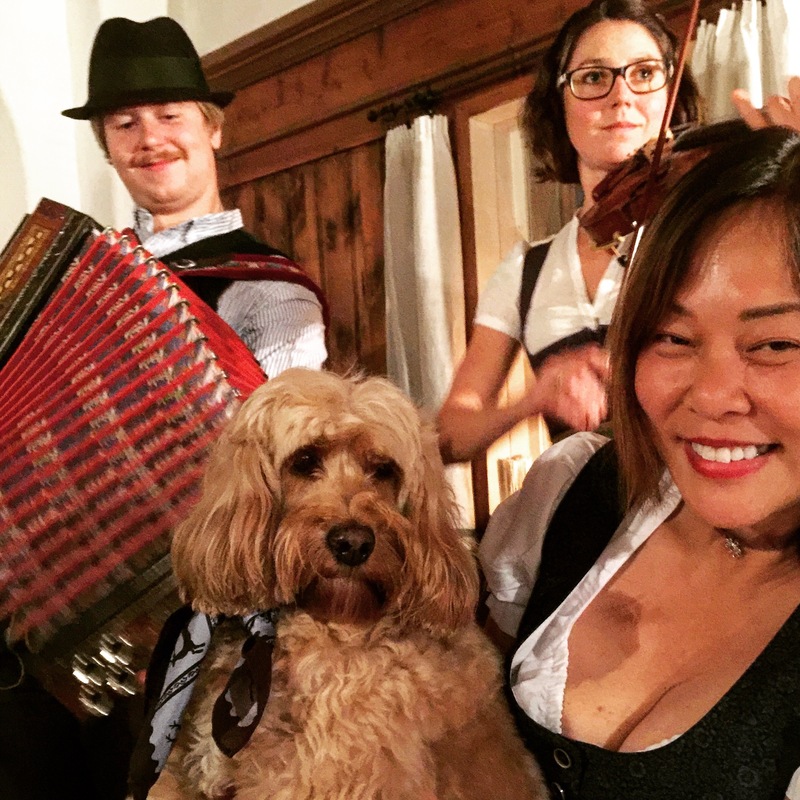 There was a dirndl party and the next day, I attended my first wedding. 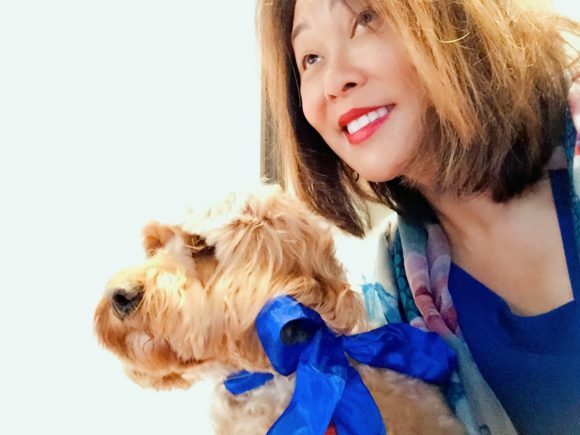 Mummy and I wore matching blue. There were a lot of people about 160+ and I was a hit with the kids there, doing tricks to entertain them. Before the wedding we had stopped over in Vienna as that’s as far as we could have flown from London. 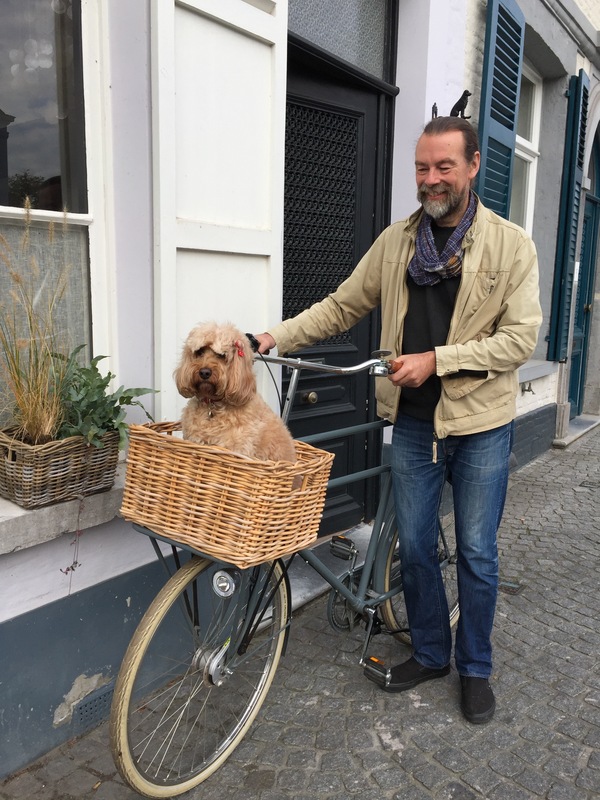 When we were there, one of Mummy’s friends, Hansi drove over from Salzburg to meet the real me – he had met Impostor when they were in Charleston earlier in the year. After the wedding we returned to Vienna for a quick touristy evening. 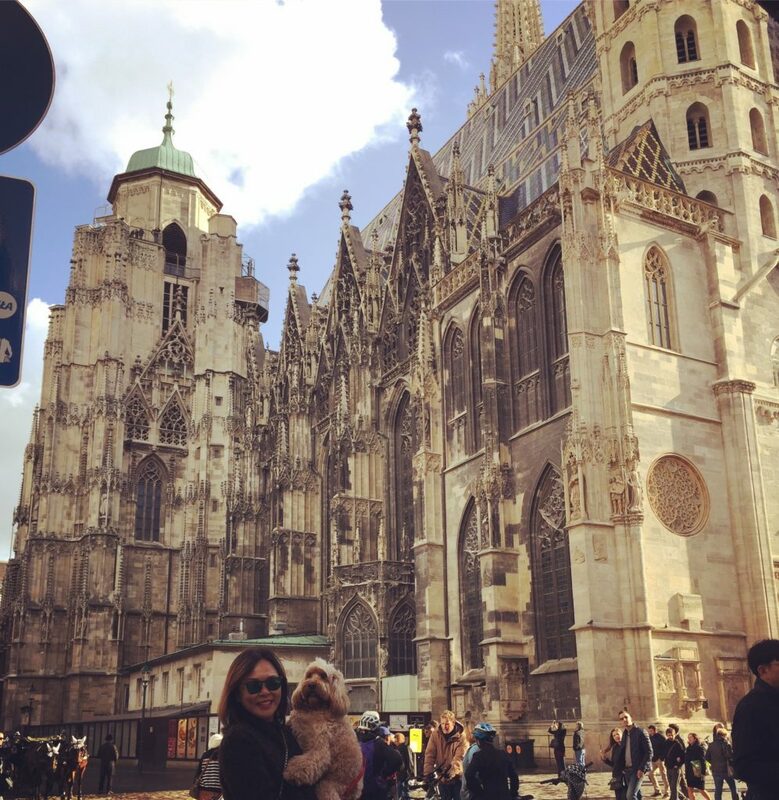 We finally saw Stephansdom up close and Mummy had her wiener schnitzel and a milch cafe and apfelstrudel at Cafe Hawelka, one of the oldest in Vienna – After a night in Vienna, we flew back to Zürich and because I couldn’t fly back to the UK in-cabin, Mummy thought it would be nice to just enjoy the journey. We took the train rest of the way. We used the “journey” to visit new places, revisit places with memories and see old friends. 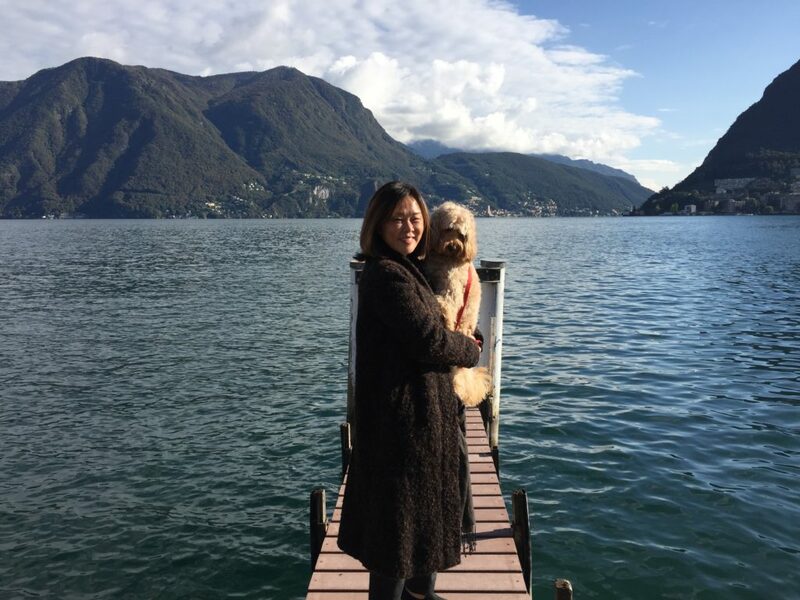 As we were in the same country as Muffin, who had recently moved to Lugano, we diverted from our journey up north and went south to visit pretty Lugano. Do you remember Muffin? Carolina was very taken by you when they used to come to the Hyde Park meets. Muffin showed us the beautiful views from her house! From German-speaking Austria to Zürich, this part of Switzerland was Italian speaking – which meant we were very close to Italy! Like 20 minutes away! 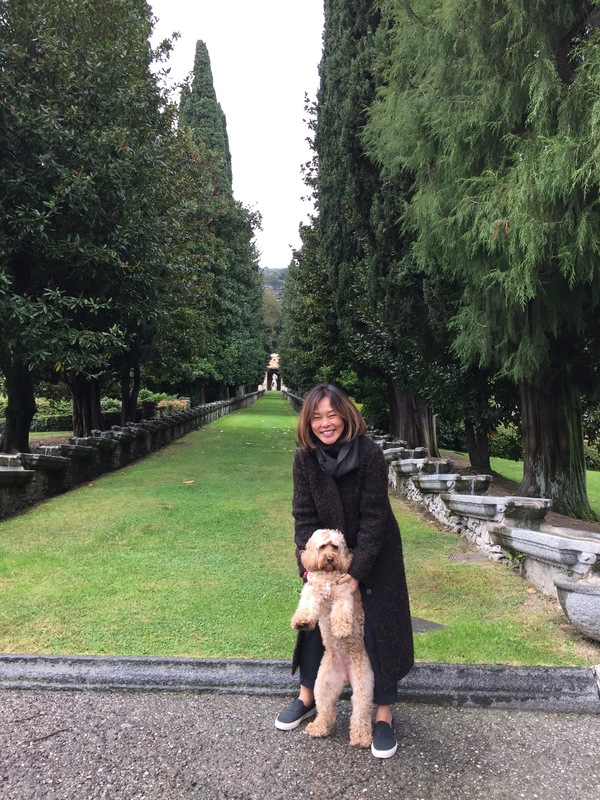 So the next day we drove over to Como, Italy because Mummy really wanted to show me Villa d’Este in nearby Cernobbio. This is one of the special places where she wanted to re-create memories from the past – with me. She wanted me to run up the green but I didn’t feel like it. Instead I ran alongside the lake! After the quick visit with Muffin and her family, we continued on our way home. 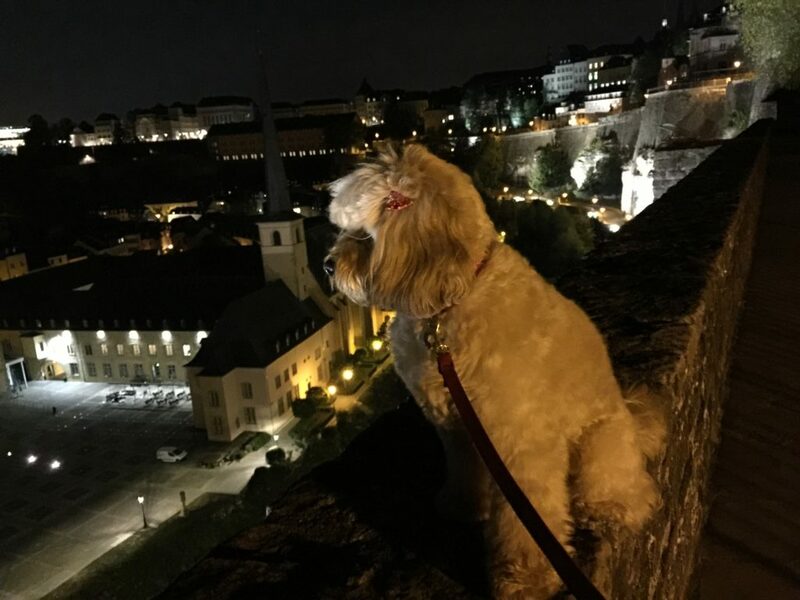 A long train ride via Zürich to Luxembourg – and saw the city at night and the UNESCO sites. They were beautifully lit up. And we met another of Mummy’s friend, Yoon-Shin while we were there. 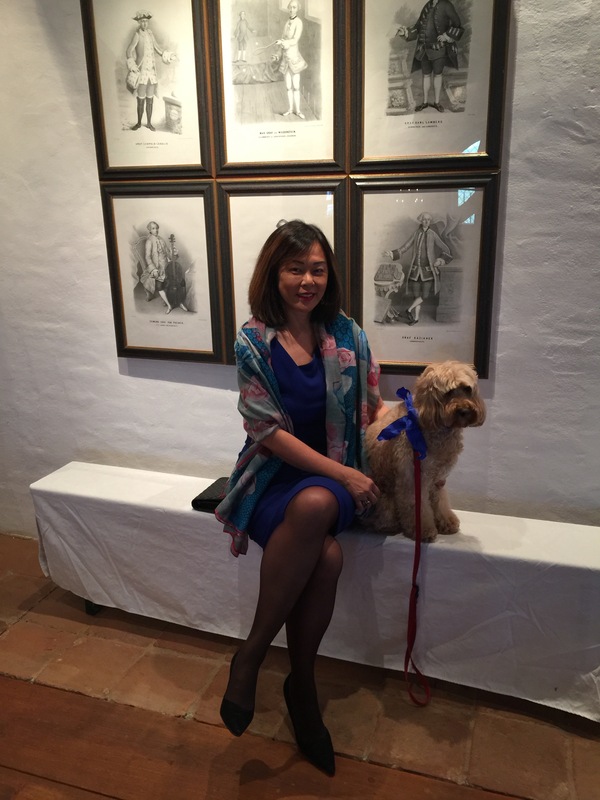 They had a rescue dog from Malaysia who lived with them in many countries – Malaysia, Korea, Singapore and of course Luxembourg. By now we have moved to French-speaking territory. From Luxembourg it was another slow train ride to Brugge via Brussels. Only within an hour’s train ride, people here spoke Flemish or Dutch! It was the place for pictures by canals, to seems. We stayed at the charming and eclectic Dog House After a dreamy night in Brugge, there were three more trains, one more country, a car ride and the Eurotunnel crossing! But not before we got checked and approved for the crossing. That was a lot of travelling: by plane (approx 4 hours), by train (approx 18 hours), by bus (1.5 hours), by car (2.5 hours) not counting all the taxis to and from airports and train stations. Most people asked what breed I am. 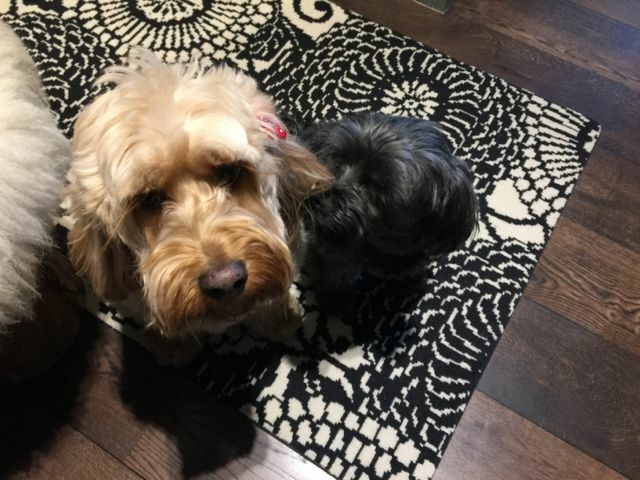 They have heard of labradoodles in Germany and Austria. 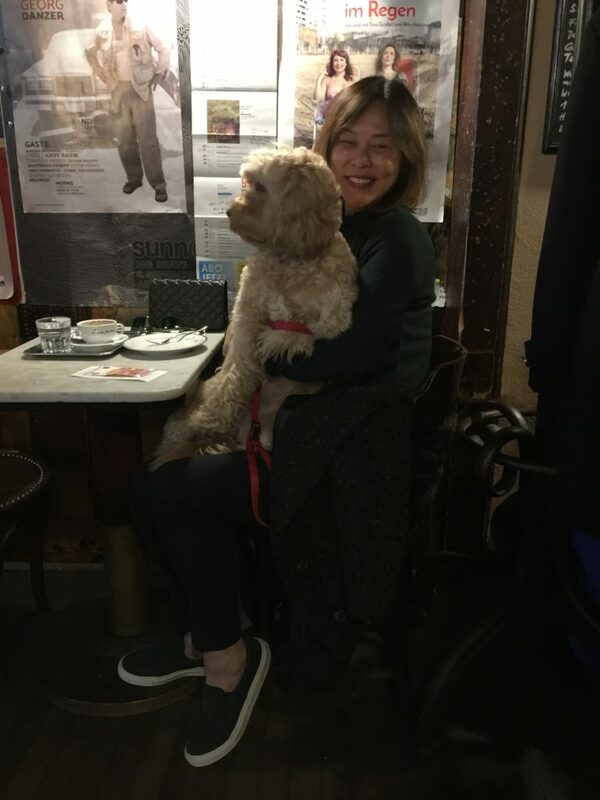 In Lugano, even the vet had never met one of us before, even though Mummy reminded her that one of her “clients”, Muffin is a Sproodle – which is pretty close. 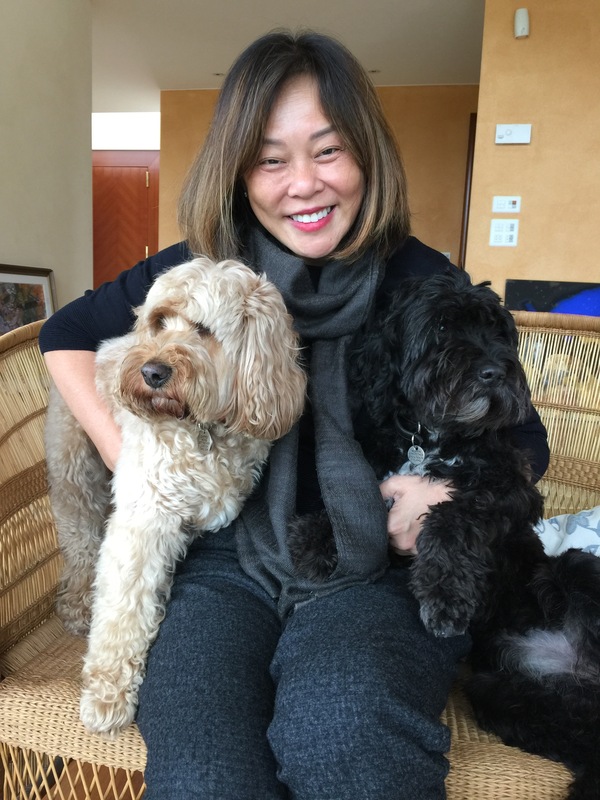 At Bautique, they have maltipoos as their client, but not us. So that was rather interesting, I thought. And we might have converted a person in Luxembourg to consider getting one! Yay! 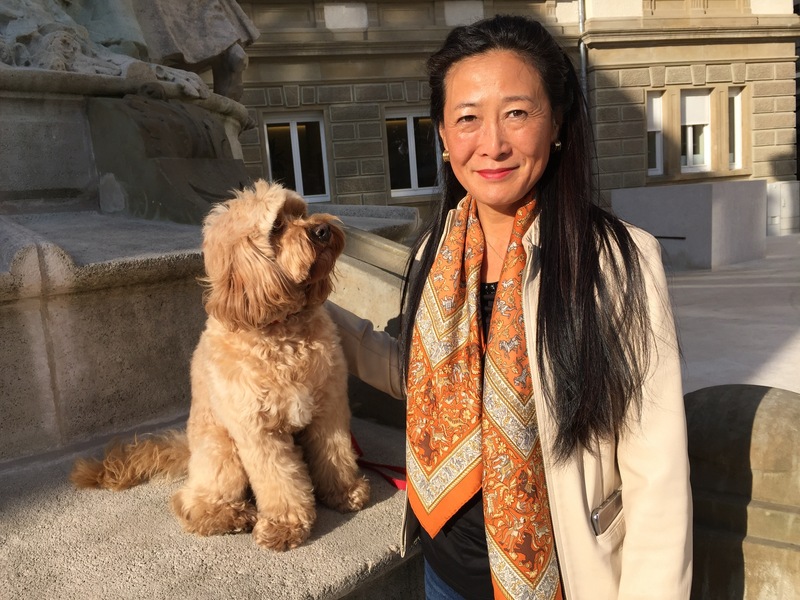 Even on the continent, people are unaware of pet travel. When we were flying, some passengers came up to ask how it was possible for me to fly in-cabin. Mummy had to tell them that we had special permission from the doctor to fly as an emotional support dog. It wasn’t all easy for Mummy because not all airports would allow me to walk around on the leash. At Heathrow and on previous trips at Charles de Gaulle (Paris), I had to be in a bag. So poor Mummy had to carry me in a bag – she has a sore shoulder! 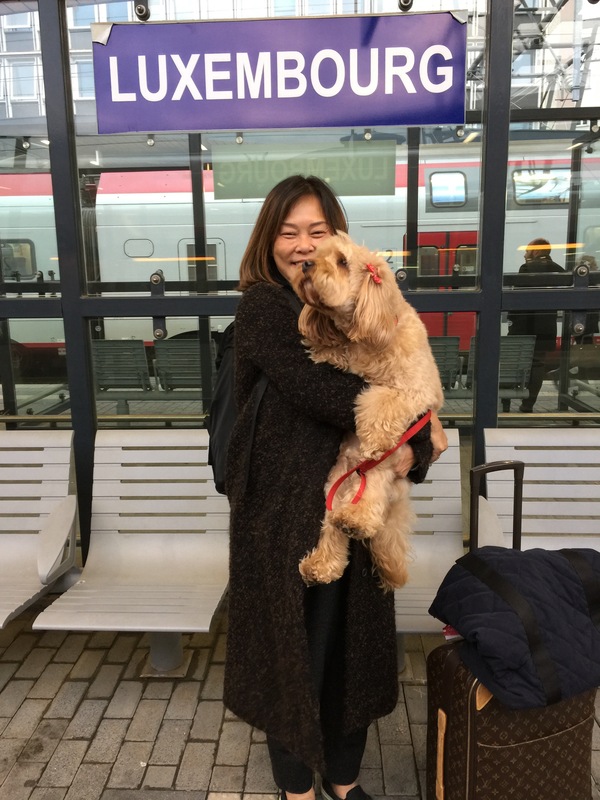 And we were asked by a potential dog-owner on the train to Luxembourg if it was possible to travel with the dog on the train. When in the cities, town centres, there aren’t a lot of places where I am allowed off-leash, even in the local parks. 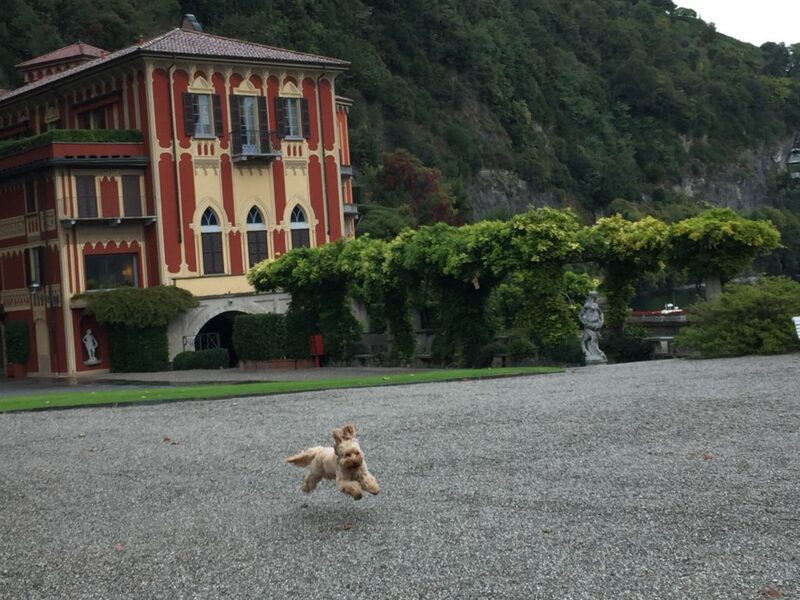 The only time I could run freely was when we were in the countryside – on the grounds of the castle in Austria. But we were allowed into most restaurants and very nice ones too! We went into shops. 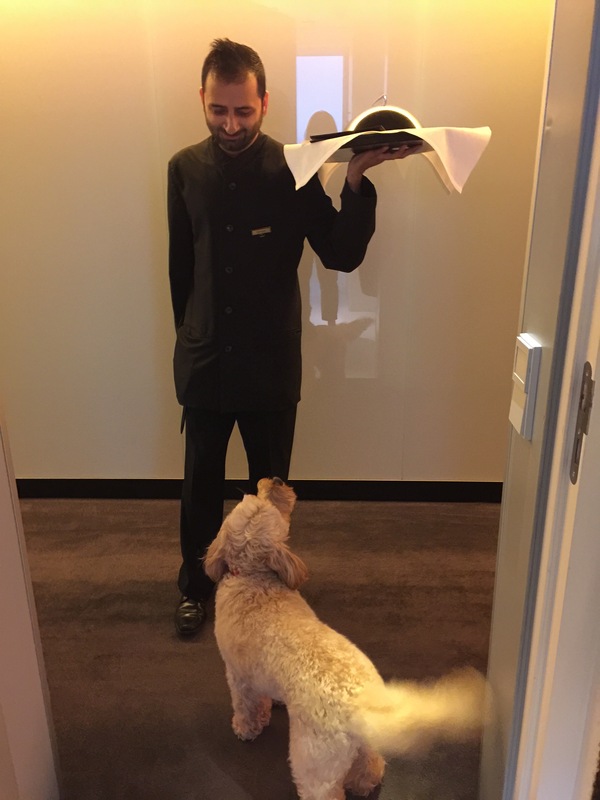 Many hotels were dog-friendly. It was a continent of many languages, and many beautiful sights. Chocolates seems to be the order of the day from Switzerland to Vienna’s Sacher Torte to Belgium! 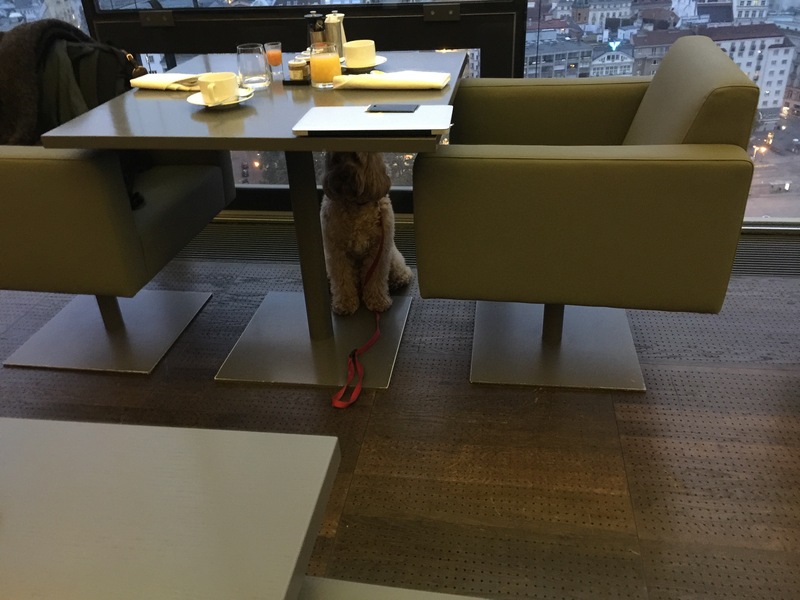 I had all versions of raw minced meat – some more generous than others, and because I did not exercise a lot and ate well, thankfully after Zurich there weren’t many other times Mummy had to carry me. It was a really interesting experience but I am also glad to be home – and to see you. But when is our next trip? May’s comment: It was a longish trip and a complicated one with lots of destinations and different means of transportation. I used to be a frequent traveller during my hey days. But since Darcy and then George came into my life, my trips have been shortened, more considered and less frequent. If I had gone to the wedding on my own, this would have been a return flight over a weekend to Vienna. But with Darcy, it became a longer drawn out journey because I could not fly back into the country with Darcy in-cabin. So I took the opportunity to visit with friends and to enjoy the beautiful places along the way. Thankfully, Darcy’s a brilliant traveller – taking things in her stride – very calm and it seems she almost knows when there’s a contentious situation, she becomes very quiet and curls up into a ball under a chair. And whoever is questioning her civility would immediately withdraw from pursuing their demands. 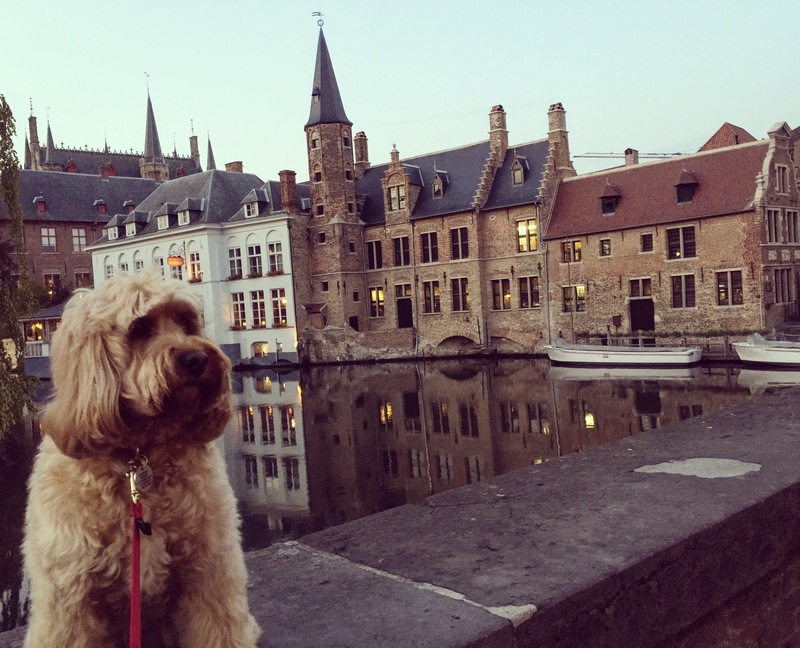 So is the continent more dog-friendly than the UK? At least the places where we’ve been – Germany, Austria, Switzerland, Luxembourg and Belgium were. They were more relaxed about us going into restaurants, cafes, shops BUT in certain countries like France and Luxembourg – the taxi drivers were not a certainty. The drivers refused or grumbled at us. But if they were carried in bags they were more likely to accept them. I’ve had very little problems travelling with Darcy and George in London taxis or buses or the tube. We travelled extensively in the UK on trains. But outside of London, public transportation must be negotiated. 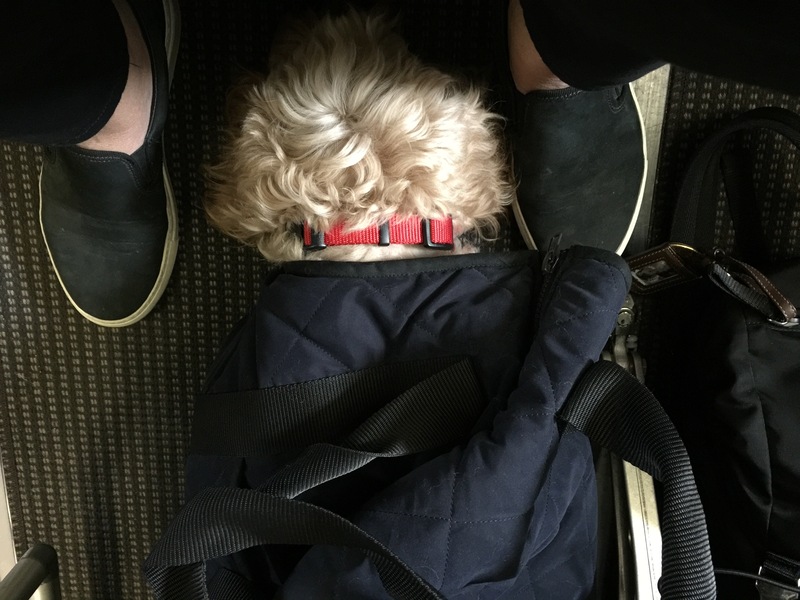 When travelling in public transportation, dogs are supposed to be muzzled if on leads. We’ve never had to except for the bus ride in Austria when the driver asked us to do so. We had just come off a train and the train conductor who was there to translate his request felt silly asking me the question when we’ve been on a long train ride on his train without one. No off-leashes in cities and town centres, which we’re not allowed to in London either. But in most London parks we can run off leash but in the city parks where we visited. Now I understand why when friends visiting are surprised to see them running freely in Hyde Park. But then maybe there’s a reason for the on-leash rule. When I hear about dogs in UK being attacked by other dogs, this comes to mind. Maybe it is not such a bad idea. in the UK, we can run off leads in the parks, in all the cities we went to, we had to be on leads even in the parks. In London we are 98% welcomed in public transportation and taxis. And we do not have to pay to travel on trains. In Europe, a second class ticket is required for dog travel when on a leash but not if carried in a bag. It’s 50% of a child’s second class ticket in some countries. we know many restaurants in London where dogs are welcomed but more difficult outside of London. In the cities we visited, we were welcomed even at the best restaurants. And we went into stores without having to ask. So while the London we know is mostly dog-friendly but I could immediately sense the difference when we arrived in Folkestone – no dogs allowed in the train platform cafe. Really? What health and safety can there be with all the people coming and going and the filth of travel. The next time I buy a roller bag, I will get one that has four wheels that I can roll along. That way I can put the dog bags on it and save my shoulder and back from strain and pain! The backpack was the best thing I bought for travel. Between the roller bag and a normal size back pack, we managed for 10 days (including attire for a wedding and dirndl party!) Our timings were quite tight so I did not want to risk checking in bags which meant no handbags as that would have counted for three. But if I did not need more than a roller bag or backpack, I always have a cross body handbag – to free up the hands.Darcy didn’t really need to drink a lot of water during our train rides. The longest ride was about 3.5 hours. If she really wanted some, I always have a bottle with me and a small cup would have sufficed. The bottle I bought for our travel was never used. That would have been more ideal when we’re walking in the parks on a hot summer day. Since we feed raw, it was actually very easy. When I was staying with friends, they were too happy to provide the minced meat from supermarkets and I diced up carrots and added some bananas to the meat content. When we stayed at hotels, I had called ahead to let them know I wanted raw minced with shaved carrots. And they all provided that with room service charges. So a bit pricey to say the least. But I was travelling to remote places and not exactly a walk to the local butchers. But whenever I was in a town, I would go to the local butchers and bought the meat myself. And a banana to add a little variety. But I did have a can of wet dog food with me – it is the Royal Canin Sensitivity – the only non-raw that I had fed Darcy with. During those days when she had runny tummies from her food, the vet always gave us this to help settle her stomach. So when I got to the end of the trip and too much already spent on her food, and looking to lighten the load, I gave her this. Even with raw meat and all the changes in environment, her poos were not the same as when we are on a regular diet at home. So this actually helps to calm her tummy. Most interestingly, I have seen how Darcy had grown with trust. On previous trips, I had to make sure I tied her down whenever I went to the WC when on the train. She would walk out into the aisle and stared after me, focused on where I was going. 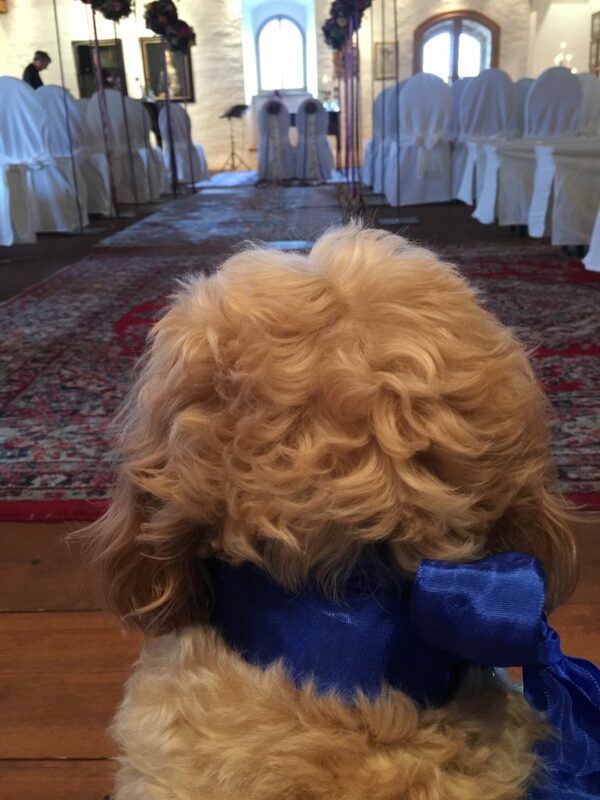 I would often look down the aisle to see her head poking out from the seat, looking concerned. This time, whenever I told her to stay, I would come back to find her sitting exactly where I had left her. The same as when we were at a hotel buffet breakfast. The first time she walked from under the table to see where I was going. The second morning she sat under the table and waited for me. In return I rewarded her with some ham! She still doesn’t like escalators. When I do have to get on one, I carry her as her hair might get caught on the grooves of the moving steps. It is also always so busy, she might get stepped on. So the back pack and roller bag were amazing for these circumstances. I have at least one free hand to hold her. If only she’s under 8 kg, it would be a lot easier on the carrying. And even though I can get her on the plane, there’s still a lot one must consider should you choose to fly. Be ready to carry your dog in a carrier bag regardless if you have medical reasons to fly with them. 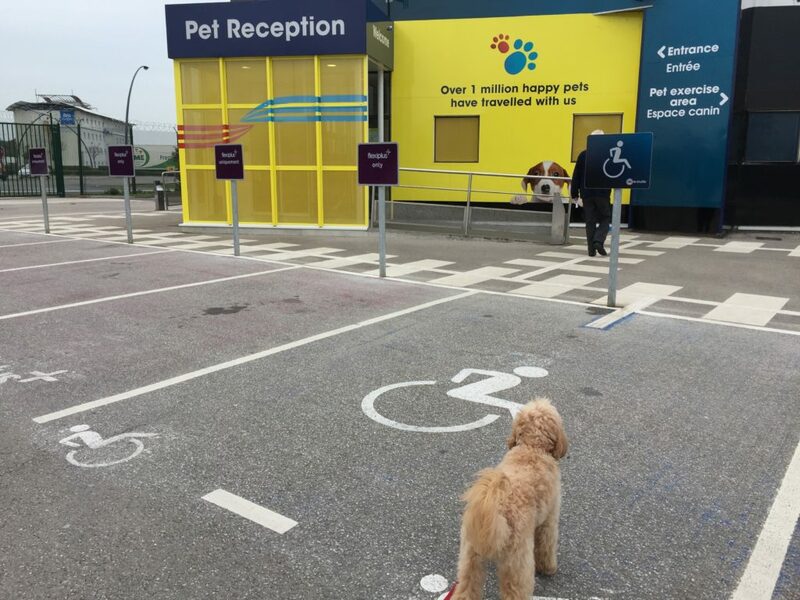 Some airports just do not tolerate dogs walking around. And of course the escalators. It is not good for them to get on one. There are usually lifts or stairs as alternatives. Also better for the luggage. In some cases it applies to taxis such was our experience in Paris, Nice and Luxembourg. If they are in bags, it is tolerated. 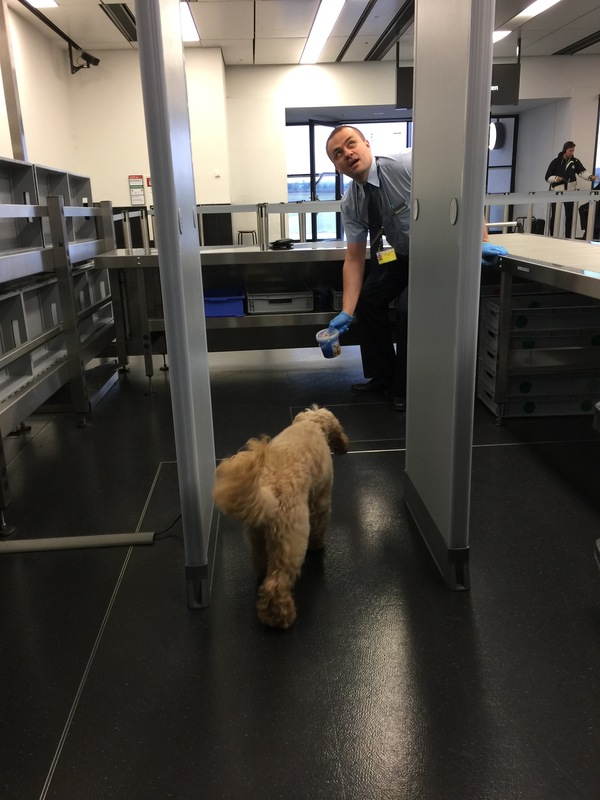 Going through security is a busy place, just be sure your dog is calm and does not fret about walking through security with another person. It is always different. In one instance one of the security staff led Darcy over on the side while I got patted down – I always do since my hip replacement sets off beeps. In another instance, her collar was removed as there’s metal on it, and she followed me through the scanner. Again while I got patted down, she stayed by my side waiting. When in Vienna, she had to go through one by herself! Don’t forget there can also be security dogs on the other side of the scanner. Be aware. I know Darcy would bark up a storm if there was a German Shepherd. In the plane, they have to sit under the seat in front of you. After that it varies from plane to plane – not even airlines, the on board staff have different knowledge levels about dogs. Some of them would be happy for you to pick them up and have them in their bag on your lap. Other times, it is an absolutely not at all. 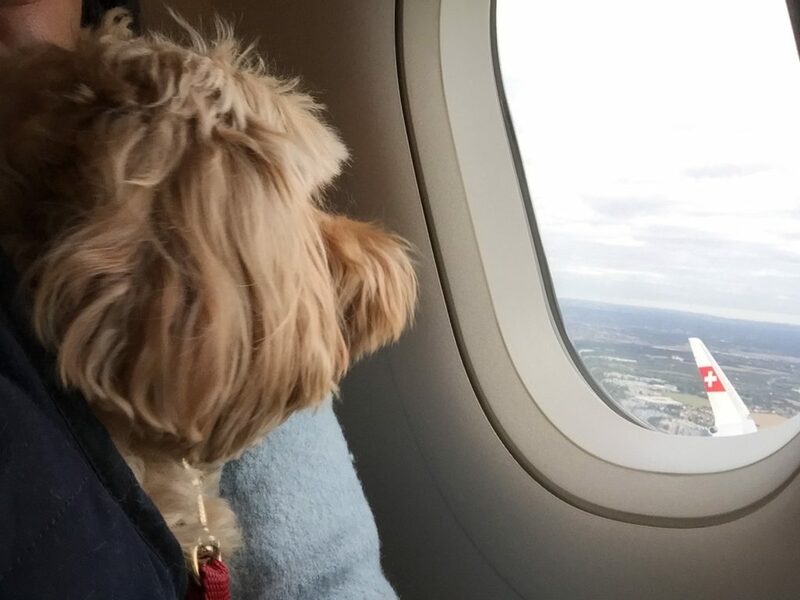 When the passenger next to me loves dogs and everyone else around me loves them, surely it wouldn’t be a problem. In conclusion, yes, most of Europe is more dog-friendly than the UK. But now always. We’ve looked into travelling to the Nordic countries and have already found that in Norway, the regulations are no dogs at all in restaurants. We’ll leave that for another day. Very interesting May. 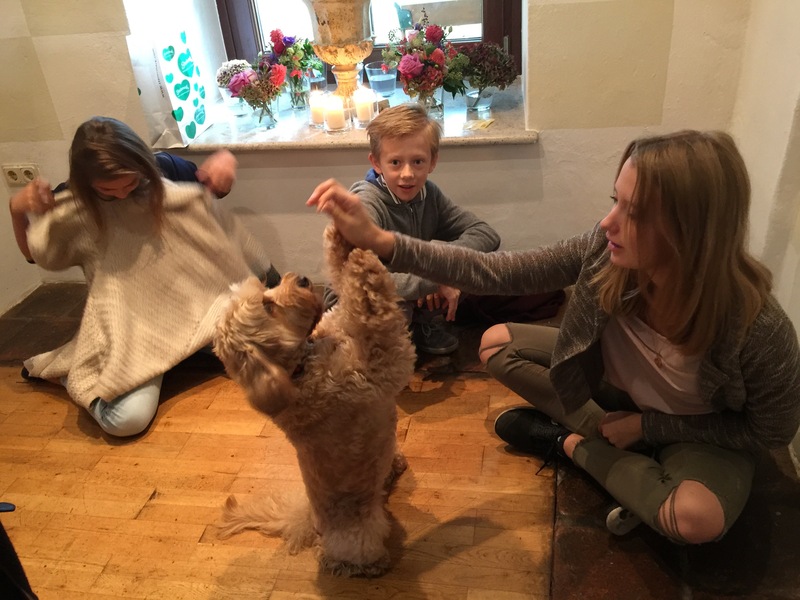 We’ve just spent three weeks in the Languedoc with Lola our cockapoo. We stayed in five different hotels, all were dog friendly. One was overlooking a beautiful beach which she was not allowed on. In fact we could only find one in the whole of the area. It seems that Spain and Portugal are the same according to fellow travellers with their doggy friends. Anyone know of any that do allow dogs during the summer would be greatly appreciated. Love your adventures though Miss Darcy, George and May. You are trail blazers for sure. We’re you there during the summer months? We arrived on 1st September till 21st. The beach next to our hotel In Marseillan, dogs were banned till 30th September. We found one beach at Portitagnes where dogs were allowed on one half of the bech but had to be kept on the lead. We did see some locals walking their dogs on some beaches but we felt a bit scared to disobey the law. We live next to the sea and a three mile beach here in Cornwall, and although we have peak season restrictions on dogs, they have to be kept on a short lead, there is a huge area for running free. She has always loved the beach and the sea, so it was a bit of a shame that we also couldn’t visit any of the lovely beaches. The hotels, restaurants and cafes were brilliant though. We were made very welcome. Lola is very well behaved like Miss Darcy so on our round trip of 4,000 miles in the car she was an angel and was made a complete fuss of wherever we went with her. What wonderful travels you have! Thank you for sharing them with us. Sounds like you’ve had a lovely adventure and I enjoy reading your posts. I would just like to mention 2 things. 1. Dogs off lead. In most european countries dogs are callowed to be excercised off the lead in the countryside. 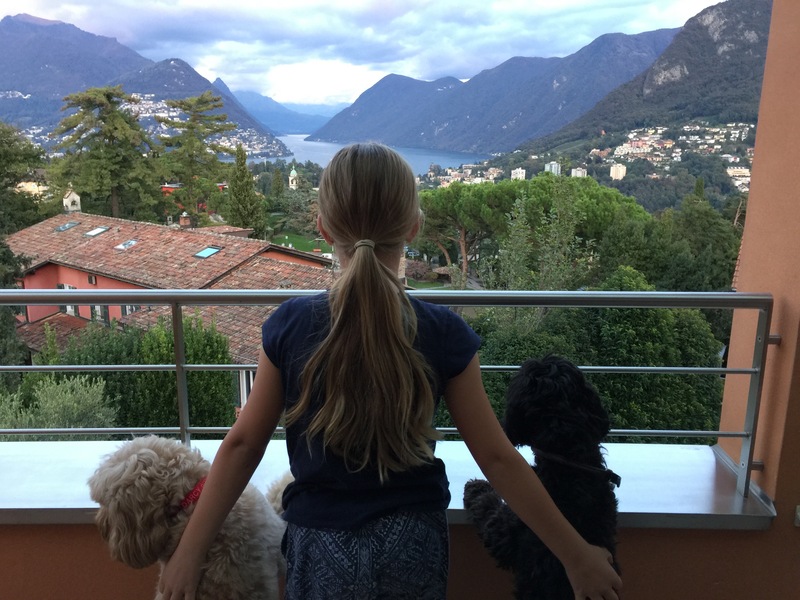 I spent many childhood summers in Lugano it was lovely looking at your photos. At monte bre just outside lugano there is miles and miles of countryside paths where its fine for dogs to be let off lead. Having holidayed abroad to many european countries with dogs over the years we’ve never had a shortage of finding places where they can be let loose?! I would say though but finding dog friendly beaches in europe is not as easy as finding dog friendly beaches in the UK. 2. 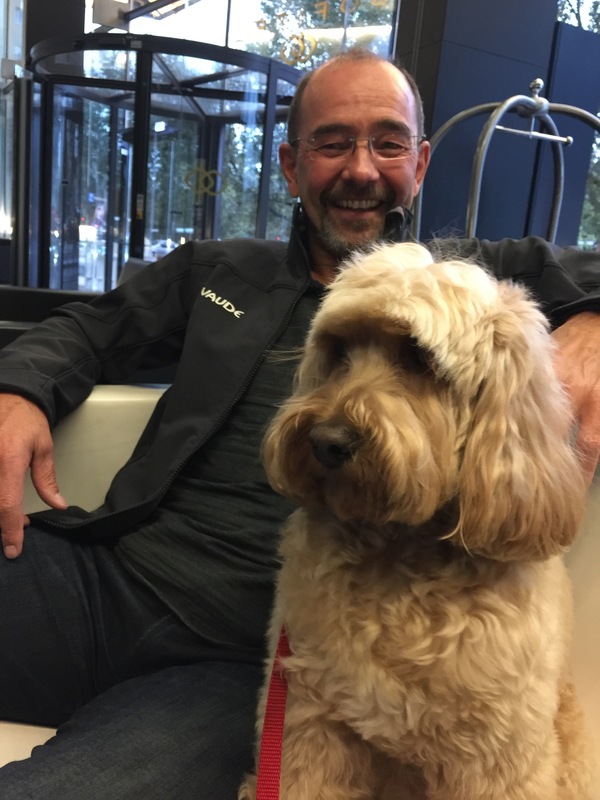 Emotional support dog – I would be interested to hear where you got the authorisation from as this is actually only viable under US law not here in the UK? I feel your comments regarding emotional support dogs is misleading? Sorry, totally missed your comments. 1. Dogs in most European CITY parks where we travelled to, had to be on the leash – especially in Switzerland – friends who live there was warned a couple of times going through the forests near where they live. Only in a small part of the Tuileries in Paris were we allowed off leash. Danish friends tells me of similar experiences in Copenhagen. Obviously in the countryside the rules are not stringent when we were in the remote parts of Austria, yes, Darcy was running off leash on the castle grounds. 2. Emotional Therapy Dogs in the US is a bit of a farce. I have authority to travel with Darcy in cabin with a letter from my doctor – for reasons that are personal. But it is no guarantee that any airline would accept it. I fly with airlines that are more lenient.